There must be a good reason you'd be in an open air basket 367 feet above the ground. Besides hot air ballooning, you might be standing in a Bronto S-112 HLA, repairing hunchback damage atop the world's most famous cathedral. Whether you're comparing it to the Amiens Cathedral or the whole of the Fighting Irish—stacked atop one another—the Bronto S-112 HLA is still the tallest. Built by Finnish manufacturer Bronto, the S-112 HLA (High Level Articulated) holds the world record for highest reaching basket lift. And it doesn't just go up. 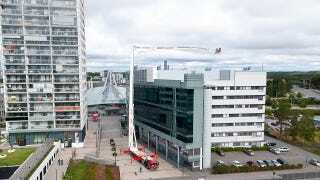 By optimizing its height-to-weight ratio and using a high tensile steel boom structure, it can bend the crane arm at a 90° angle, 290 feet up (~26 stories), and extend out to a working radius of 82 feet—roughly the length of three Minke Whales or two 72-person school buses. This allows crews to reach otherwise inaccessibly high areas, like the underside exterior of a wind turbine rotor. Obviously, in order for a basket to rise that high, it needs an incredibly stable base. That's why the lifting assembly is mounted on a Mercedes Benz model 76.60 9-axle commercial truck chassis, with five steered and four driven axles. The entire rig weighs a sturdy 75000 kg, about 82 tons or two Doosan Moxy Articulated Dump Trucks. It also uses an automatic levelling system that sets up in under a minute (because we need that cat out of the tree ten minutes ago!) and a Telecontrol system with an visual interactive display.